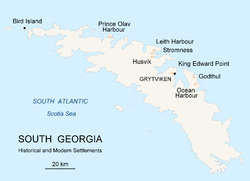 The Island of South Georgia is said to have been first sighted in 1675 by Anthony de la Roché, a London merchant, and was named Roche Island on a number of early maps. It was sighted by a commercial Spanish ship named León operating out of Saint-Malo on 28 June or 29 June 1756. Commercial sealing was conducted on the island between 1786 and 1913. During that period 131 sealing visits are recorded, eight of which ended when the vessel was wrecked. Modern industrial sealing associated with whaling stations was carried out between 1909 and 1964. Sealing era relics include iron trypots, hut ruins, graves and inscriptions. On 19 March 1982, a group of Argentinians arrived at Leith Harbour and raised the Argentine flag on the island. On 3 April, the second day of the Falklands War, Argentine naval forces formally annexed the island. South Georgia was retaken by British forces on 25 April during Operation Paraquet. 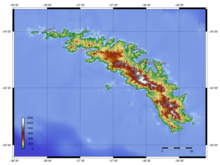 The island is classified as an ET or polar tundra climate on the Köppen-Geiger classification system. 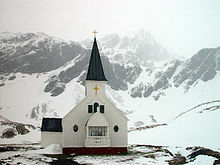 It has no tree cover, and there is generally snow on the island during the winter months (April–November). The terrain is mountainous, with a central ridge and many fjords and bays along the coast. Additionally, South Georgia is a breeding ground for elephant seals, fur seals, and king penguins. The island is home to the South Georgia Pintail and the South Georgia Pipit, the only known habitat for these birds. The island's topography includes a stepped sequence of flat surfaces interpreted as wave-cut platforms formed when sea level was higher relative to the island. At sea level strandflats have been described. In 2018, the island was declared free of invasive rodents after a multiyear extermination effort. ^ "Google Maps". Google Maps. Retrieved 2017-07-18. ^ "Historia General de las Relaciones Exteriores de la República Argentina: Georgias del Sur" [General History of Foreign Relations of the Argentine Republic: South Georgia Islands]. www.argentina-rree.com (in Spanish). Instituto Iberoamérica y el Mundo. Retrieved 2017-07-18. ^ R.K. Headland, (ed.) Historical Antarctic sealing industry, Scott Polar Research Institute (Cambridge University), 2018, p.168, ISBN 978-0-901021-26-7. ^ Amos, Jonathan (2018-05-09). "Rodents driven from South Georgia". BBC News. Retrieved 2018-05-09. ^ Chalmers, M.; Clapperton, M.A. (1970). Geomorhpology of the Stromness Bay – Cumberland Bay area, South Georgia (PDF) (Report). British Antarctic Survey Scientific Reports. 70. pp. 1–25. Retrieved January 29, 2018. ^ "The Intrepid Rat-Sniffing Terriers of South Georgia Island". atlasobscura.com. 17 May 2018.